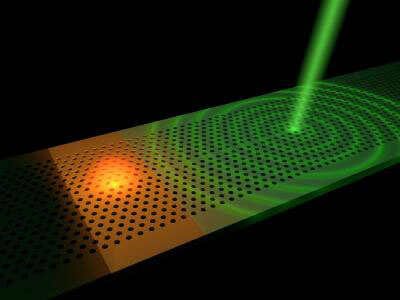 (Nanowerk News) The researchers etched a photonic crystal around several quantum dots in a semiconductor layer. Quantum dots are small structures that spontaneously emit light as a consequence of atomic processes. If a short laser pulse is fired at the photonic crystal, its refractive index is modified and the quantum dot experiences a change in the electromagnetic field around it. This change can speed up or slow down the emission of light by the dot. As soon as the refractive index recovers its usual value, the dot emits light again in the normal manner ("Ultrafast non-local control of spontaneous emission"). Using this technique the spontaneous emission of light by the dot can be switched on and off at will. The most striking feature of this method is that the duration of the light flash can be made considerably shorter than the natural lifetime of such a dot as a light source. In the current article the researchers describe an experiment in which the light pulse was 200 picoseconds (trillionths of a second) long. Based on the underlying theory, the researchers expect to be able to make these light pulses another factor of ten shorter. Furthermore, the researchers demonstrated that the emission of the light source could be controlled using a laser pulse at a relatively large distance from the source. This result is important for the transmission of quantum information, for example. This requires light sources that can emit individual photons (light particles). Being able to control time-dependent properties of these photons is important for the exchange of quantum information between different parties. The method now proposed for the remote control of the light source makes this possible without influencing the other properties of the emitted photons.